While Elvis Presley was famous for his fried peanut butter sandwiches and his voracious appetite, Elvis Ncube in Zimbabwe is lucky if he gets a daily meal of porridge and beans. Elvis’ mother left for Botswana for a short period to find work in 2005, but she never returned. Life in Madabe village, southern Zimbabwe, is tough for Elvis, 23, and his sister Edita, 19. “I am in charge of the household, so I can’t get work when I’m looking after the children,” says Elvis. 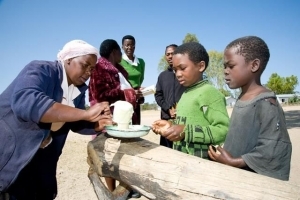 Up to one quarter of Zimbabwe’s children are said to be orphans. The AIDS crisis is mainly to blame for robbing families of the parents and leaving children in the care of grandparents – or alone to fend for themselves. But with the deepening economic and food crises, children are increasingly left behind as their parents go to search for work abroad. The challenges the sons and daughters of Zimbabwe face as a result are massive. Caritas has been providing the family with monthly food rations of mealie meal, cooking oil and beans. However, lack of funds may mean that the rations will stop. “When this food is finished I will go to other household nearby to ask for assistance,” says Edita. If the economy were stronger and there were more jobs, Elvis would try to support the family himself. “I completed my A-Levels last year. I’ve not been able to find work. I’m just volunteering,” he says. But without parents around to help, both Edita and Elvis face great difficulties in trying to improve their own and their siblings’ lives. “Even the night before my exams, my sister was in labour and I was the only one she could depend on for help,” says Elvis. With no opportunities on the horizon in Zimbabwe and with the heavy responsibility to feed his brothers and sisters, Elvis sees only one possibility to get out of the grinding poverty and uncertainty which is dogging their lives.